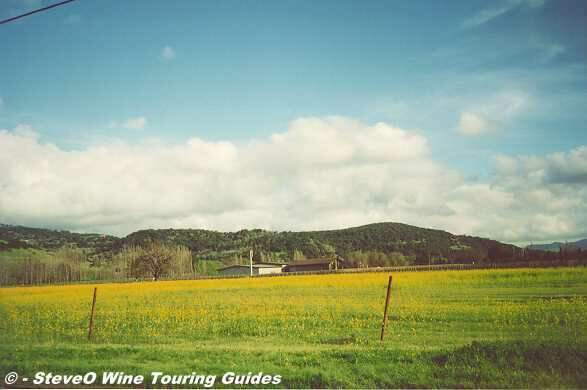 Welcome to my California Napa Valley Wine Touring Guide. This page took quite a while to get all typed in!!! It continues to be updated. Please note if you are looking for a Napa Winery and can't find it in the index, please page down the list since the index is the part that needs work the most. Any errors are probably my typing. Please let me know if you see missing or defunct wineries. I've been enjoying wine touring in the area for a number of years and figured I'd pass on some information. This page is ENTIRELY Non-Commercial! I have no connection to any winery except as a happy consumer and occasional visitor. In this page I've included all the wineries I could track down and I'm continuing to gather more information. I have included both wineries that are open to the public and those who are not. I hope you enjoy visiting some of these places on your search for the pleasure of wine. Hey...tell 'em SteveO sent you. Napa Valley is a wine touring region where you can find almost anything from fine Cabernet Sauvignon to Chardonnay to Ports. Napa Valley is by far the most visited wine region in California. As such, it probably has the best developed tourist facilities from hotels to restaurants to winery tours. As such, it is also the most crowded of California's Wine Regions. Any feedback, corrections, questions are welcome at otruba@californiawineryguide.com. Napa Wine Merchants, 1146 First St., Napa Open Mon-Sat from 10-5. (707) 257-6796. Back Room Wines, 974 Franklin St., Napa. 10 a.m.-6 p.m. Monday-Thursday, to 9 p.m. Friday and Saturday, Sunday by appointment.. (877) 322- 2576. The Bounty Hunter Rare Wine & Provisions, 975 A-B First St., Napa. 11 a.m.-7 p.m. daily. (800) 943-9463. Napa General Store, 540 Main St. at Hatt Market, Napa. 11 a.m.-7 p.m. daily. (707) 259-0762. Napa Traditions, 1202 Main St. 10 a.m.- 5 p.m. Monday-Saturday, 10 a.m.-4 p. m. Sunday.. (800) 627-2044. ZuZu, 829 Main St., Napa. 11:30 a.m.-10:30 p.m. Monday-Thursday, 11:30 a.m.- midnight Friday, 4 p.m.- midnight Saturday, 4-10:30 p.m Sunday. (707) 224-8555. (707) 226-9991. (877) 226-1700. FAX (707) 226-1685. Open By Appointment Mon-Sat 10-4, Sun 12-4. (707) 253-1139. FAX (707) 224-2518. (707) 963-9999. Fax (707) 963-9998. (707) 226-1281, FAX (707) 226-3881. (707) 204-9522. FAX (707) 598-0543. Tastings at The Vintner's Collective, 1245 Main St., Napa. (707) 968-9770. Fax (707) 968-9771. (707) 257-8700. Open by appointment M-F.
(707) 226-7669. Fax: (707) 226-2326. (707) 963-4334. Open Thur-Mon 10-4. (707) 965-1020. Open by appointment. (707) 963-3429. FAX (707) 963-5780. (707) 942-6995. Fax: (707) 942-0895. Hours: M-F 9-4:30, Sat-Sun 10-4:30, Tours by Appointment. (707) 942-4912. FAX (707) 942-5854. (707) 942-8101. Not open for tours or tastings. (707) 944-9261. FAX: (707) 265-7917. (707) 942-8691. Open by appointment. (707) 942-6684. Open daily 10-5:30. (707) 252-2292. Fax (707) 259-5395. Visit their Web Page: Black Coyote??? (707) 253-1400. Open daily 11-5. (707) 252-9065. (800) 654-WINE. Open daily 10:30-4. (707) 963-5411. Open daily 11-6. (707) 963-4766. FAX (707) 963-8774. 360 Howell Mountain Road South, Angwin, CA. 1591 Dean York Lane, St. Helena, CA. (707) 963-5221. Fax: (707) 963-1067. Tasting: Daily 10-4:30 except for New Year's Day, Easter, Thanksgiving and Christmas. No Tastings or Tours available. Open Thur-Mon 10-4:30 by appointment only. (707) 948-2643. Open by appointment only. (707) 552-5199. Open daily 11-5. (707) 257-8713. Fax: (707) 257-2788. (866) 844-WINE. (707) 963-5783. Fax: (707) 963-3714. Open daily 10-5. Tours by appointment. (888) 327-3777 Fax (310) 375-9430. (707) 965-1104. Open by appointment. (707) 942-8200. Open daily 9:30-6. (707) 967-3010. Open: Daily 10-4 Tasting by appointment. (877) 633-3954. Open by appointment only. (707) 963-2298. FAX (707) 963-5527. (707) 942-5015. FAX. (707) 942-4221. (707) 965-9393. FAX (707) 965-1135. (707) 942-4981. Fax: (707) 942-4993. Toll-free: (800) 366-8583. Open daily 10-4. Tours by appointment. (707) 944-8100. Open by appointment. Tasting Room, 625 Imperial Way, Napa. (707) 944-9247. Fax (707) 944-9272. (707) 942-2455. Open by appointment. (707) 256-3332. Open daily 11-5 by appointment for barrel tastings and cave tours. (707) 255-5412. Open by appointment Monday - Friday. (707) 944-8868. Fax: (707) 944-2312. (866) 383-9463. Fax: (707) 252-0565. (707) 252-3339, FAX (707) 252-4996. (707) 963-6067. Open daily 10-6. (707) 258-1822, FAX (707) 253-8331. (707) 255-0504. (888)829-5082. FAX (707)258-9564. (707) 942-4670. Open daily 10-4:30. (707) 942-6760. FAX (707) 942-2749. (707) 255-6070. Fax: (707) 355-3060. Open by appointment. (707) 944-2861. Fax: (707) 944-2312. Open by Appointment. (707) 963-1534. Fax: (707) 963-8620. Visitor Center open daily 10-5. (707) 255-3444. Open by appointment. Open by Appointment Only, Monday-Saturday 10-4. (707) 944-0290. Fax: (707) 944-8932. Open 10-4 Mon-Sat. Tours at 11 and 2, Monday to Friday, and 11 on Saturday. (707) 942-4956. Open by appointment. (707) 967-9128. Open by appointment only. (707) 967-9676 Fax: (707) 963-3920. Visit their Web Page: Jade Mountain??? (707) 255-5280. Fax: (707) 255-5282. Toll-free: (800) 255-5280. 15127 Sperry Lane, Saratoga, CA 95070. 440 Atlas Peak Rd, Napa, CA 94558 (707) 257-2821. (877) LJWINES. Open by Appointment. (707) 967-8020. (888) 875-9096. Fax:(707) 967-8019. Open Sat 11-4, Mon-Fri 9-5 by Appointment Only. (707) 254-7572. Open by appointment. Visit their Web Page: La Jota Vineyard Co.
Tasting available at the Napa Wine Company, Hwy 29 & Oakville Cross Rd. Visit their Web Page: Laura Michael Wines - Zahtila Vineyards??? (707) 963-5972 Fax: (707) 963-7512. Open by appointment. (707) 255-3400. FAX (707) 255-3402. 800 LIPARITA (547-2748). Tasting at Napa Wine Company in Oakville. (707) 823-9586. Open by appointment. (707) 290-8123. Fax (707) 963-9385. (707) 944-2807. Open Daily 10:30-4. (707) 255-5862. Fax: (707) 255-6385. Tasting and tours by appointment only. (707) 963-5292 Fax: ( 707) 963-4616. Mason Cellars Tasting Room at Oxbow. 714 First St., Napa. Open Thur-Mon 11-6. Tours: Guided (advance reservations recommended) starting at 10am. (707) 252-1295. Fax: (707) 254-9327. Open by appointment only. (707) 942-3434 Fax: (707) 942-3469. A custom crush facility where more than 55 producers make wine. (707) 963-2592, Fax: (707) 963-5913. (707) 965-2989. Fax: (707) 965-3010. (707) 963-7504. fax: (707) 963-7504. Open by appointment. (866) 367-9943. (707) 945-0890. Open by appointment. (707) 967-8160. Not open to the public. (877) 265-6700. Fax: (707) 967-8912. Not open to the public. Tasting at Ma(i)sonry Napa Valley, 6711 Washington St. in Yountville, CA. Open Sun-Wed 9-6 and Thurs- Sat 9am-10pm. Open: Mon-Sat 9-5, Sunday 10-4. Tours and Tastings by appointment. (707) 253-7500. Fax: (707) 253-1493. Toll-free: (800) 575-9777. (707) 945-1220. Open 10-4 daily. (707) 965-1246. Open weekends 10-4, weekdays by appointment. Open by appointment only. Tours in the morning, tastings in the afternoon. (707) 698-3633, FAX (707) 968-3632. (707) 967-1601. FAX (707) 286-2727. (707) 258-2558, FAX (707) 258-9558. (707) 944-9022. FAX (707) 944-8376. (707) 963-5170 (800) 622-2206, Fax: (707) 963-5752. (707) 968-1100. (800) RUBICON. FAX (707) 967-9084. Open: Daily 10-5. Public tours at 10:30 and 2:30. Rubissow Vineyards, Mount Veeder Open by appointment only. (707) 963-5105. FAX (707) 963-1382. Open by appointment only. (707) 963-1980. FAX (707) 963-3410. (707) 963-4240. FAX (707) 963-9001. Open by appointment. (877) 963-4882, (707) 963-4882. FAX (707) 963-7980. (707) 944-0749. FAX (707) 944-9271. Visit their Web Page: Serdonis?? (707) 255-5990. Closed Due to 9 October Fire. Open: Mon-Sat 9-4. Tasting appointment recommended. (707) 944-9090. (800) 869-2030. FAX (707) 944-9092. (707) 967-4188. Fax: (707) 963-2753. Open by Appointment. (707) 942-5508, (800)715-5401. Fax: (707) 942-4039. (707) 942-8265. Open daily 10-5. (707) 967-8027. Open by appointment. (707) 963-3947 Fax: (707) 963-9288. Open Mon-Sat 10-5, Sun 11-5. (707) 944-1364, FAX: (707) 944-1252. Open for tours and tastings by appointment only daily 10-5, call (707) 944-2388. (707) 963-9292. Open by appointment only. (707) 963-9454. (800) 963-9454. Fax:(707) 963-7035. (707) 968-0712. FAX (707) 598-0523. Special tastings 11am Saturday (Wine & Cheese) and Sunday (Library) by appointment.